Rat Catcher's Day (also spelled Rat-catcher's Day and Ratcatcher's Day) is an informal holiday that commemorates the legend of the Pied Piper of Hamelin. It has two possible dates: June 26 or July 22. 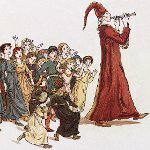 The myth of the Pied Piper of Hamelin originates in Medieval Germany. According to legend, the town of Hamelin was suffering from a rat infestation. A piper arrived in the town and promised to lure the rats away with his music. The piper fulfilled his promise, but the mayor didn't: he refused to pay the piper for his service. He left the town, but returned later to take revenge. He began playing his pipe and lured 130 children out of town. They followed him and were never seen again. The legend inspired many writers, including (but not limited to) Johann Wolfgang von Goethe, the Brothers Grimm, Robert Browning, Heinrich Heine, Bertolt Brecht, Guillaume Apollinaire. Every year, the city of Hamelin holds a festival dedicated to the Pied Piper. It occurs on June 26 because the Brothers Grimm claim that the Pied Piper led the children out of Hamelin on June 26, 1284. A similar holiday exists in the United States as well, but the date is different. Rat Catcher's Day in the US is marked on July 22, because the date of July 22, 1376 is given in Robert Browning's poem “The Pied Piper of Hamelin”.